You can’t leave enslavement if you don’t know you’re enslaved! 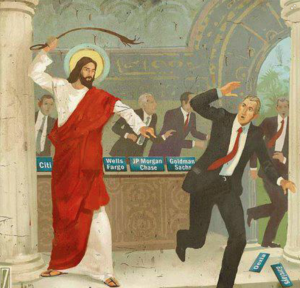 Below you will find quotes from Jesus (who’s only act of recorded aggression was directed towards “moneychangers”), Thomas Jefferson, Benjamin Franklin, Andrew Jackson and others on the topic of money. Do you know why the Roman Empire is no more? A Central banking system destroyed the plethora of wealth and stability thus sending Rome into Ruins. What arrogant empire had seen it’s best days and is set for ruin like the plethora of dynasties and great empires prior? Bet you know that answer! “Whoeover controls the volume of money in any country is absolute master of all industry and commerce… And when you realize that the entire system is very easily controlled, one way or another, by a few poweful men at the top, you will not have to be told how periods of inflation and depression originate.” Assassinated/killed/murdered/died (whatever you choose) within days of this statement. Though Jackson ended the central bank, it was re-created in 1913 under a new innocuous-sounding name “The Federal Reserve”, which is still with us today. The Federal Reserve is a private monopoly on money printing which has never been audited, is the largest creditor of the United States and has no relationship with the Federal Government. If you look it up on the phone book it is not listed in the Federal/Government section… you will find it in the business section.